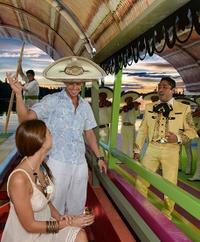 Take your Mexican fiesta on board a decorative floating barge for a 5-hour evening cruise in Xoximilco — a Cancun attraction modeled after the pre-Columbian Aztec region of Xochimilco. Ride a flat-bottomed boat called a ‘trajinera’ through the canals and enjoy a tasting menu of typical cuisine, including beer and tequila, along with traditional Mexican music. Numbers are limited to 20 people, ensuring personalized attention from your guide. After hotel pickup in Cancun, drive to the nearby attraction of Xoximilco — a tribute to the beauty and grandeur of the original canals and floating gardens of Xochimilco in central Mexico. Hop aboard a picturesque trajinera and float past other colorful flat-bottomed barges, traversing a network of canals with your guide by night. Decorated with motifs from the 32 states of Mexico, these famous boats are replicas of those once used for transporting flowers, fruit and vegetables grown in the Aztec city’s floating gardens. Observe canoe-like boats called chalupas approach the barge with food. These charming vessels also bring along musicians to liven up the mood as various ensembles play traditional tunes. You’ll be enchanted by the mariachi, bolero trio, jarocho quartet and marimba bands that entertain your small group. Your guide will host your celebration and narrate the legends of Mexico as you coast along, then return you to Cancun with drop-off at your selected hotel.